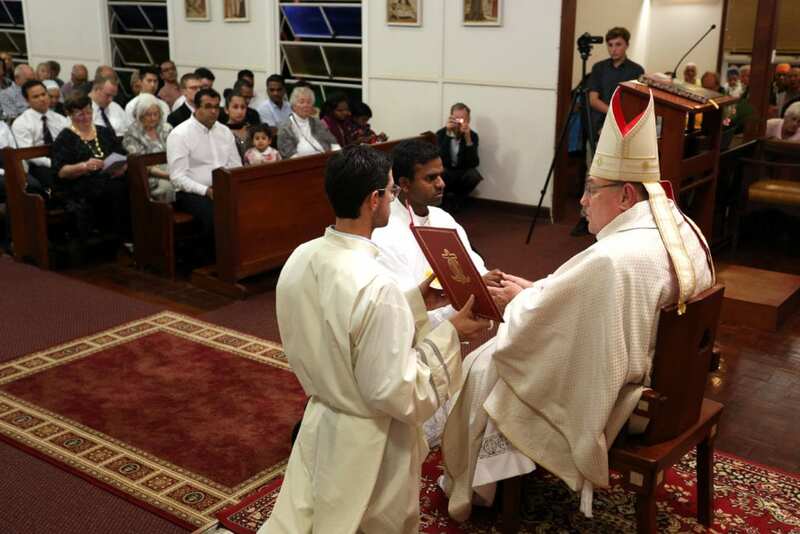 Broome Bishop Christopher Saunders and the Diocese of Broome have last weekend rejoiced in the Ordination to the Priesthood of Deacon John Bosco. Deacon John was ordained by Bishop Saunders at Our Lady Queen of Peace Cathedral on Saturday 23 June. Priests from across the Diocese of Broome joined Bishop Saunders in concelebrating the Ordination Mass, together with several priests from the Archdiocese of Perth, including St Charles Seminary Rector, Fr Phillip Fleay, Monsignor Kevin Long, Fr Vinh Dong, Fr Joseph Pelle, Fr Albert Saminedi, Fr Nelson Po, Fr Manoel Lopes-Borges, Fr Marcelo Parra, Fr Konrad Gagatek and Fr Joseph Laundy. Newly ordained Fr John Bosco receives the chalice and plate during his ordination to the priesthood on Saturday 23 June at Our Lady Queen of Peace Cathedral, Broome. Photo: Supplied. In an exclusive interview with The Record last year, the 30-year-old, who is originally from Hyderabad, India said growing up in a Hindu family, it was the Salesian priests in his village who inspired his conversion to Christianity, reinforced by his studies at a local Catholic school. Following his Ordination, Fr Bosco has shared his personal journey with The Record. I heard these words and was moved to say ‘Yes’ to the call of Christ in my heart and accept his challenge to share in the exciting adventure of bringing the his Gospel to others and making God’s saving love known in the world. I am originally from the Diocese of Nalgonda in India, a small diocese about 60 kilometres South West the vast city of Hyderabad. My journey of faith has been a surprising and profound one. I was born and brought up in a Hindu family, but then the Salesians came to our village and introduced us to Christ and faith in Him. While I was discerning my future, I had an opportunity to spend a little but very valuable time with the Salesian priests who inspired me to think about becoming a priest. Most of the priests who were serving among us had come a considerable distance from their homes where their families lived. I was always attracted by their generous ministry and good works, especially for the benefit of the poor. They inspired me to also want to help the poor and the needy in the same way. Broome Bishop Christopher Saunders blesses newly ordained Fr John Bosco on Saturday 23 June during Fr Bosco’s Ordination to the Priesthood at Our Lady Queen of Peace Cathedral. Photo: Supplied. When my desire to follow them grew stronger, I seriously began to think about the priesthood. I became very active at my parish, assisting the priests and visiting houses in the neighbourhood with them, where I began praying with the people. As my desire to become a priest became stronger, I always wanted to be a missionary priest in a foreign land. I had no idea where to go and who to approach regarding joining a missionary congregation. During this time of my discernment I had come across the Mill Hill missionaries who, as St. Joseph’s Missionary Society, had been in India for more than 130 years. I joined one of their formation centres and they guided and trained me for missionary work abroad and hence they had a significant impact on my life. My dream to go on to the missions came true when I was asked to go to Kenya for missionary experience. John Bosco make his vows before Broome Bishop Christopher Saunders on Saturday 23 June during his Ordination to the Priesthood at Our Lady Queen of Peace Cathedral. Photo: Supplied. During this time, I served in a parish slum where I fell in love with the poor and needy. But God had a slightly different plan for my missionary life. After further discernment, I decided not to continue in the formation of the Mill Hill Missionaries. I was and still am deeply grateful for what I have received from them and have maintained a very good relationship with them. I still receive considerable encouragement and support from the members of St. Joseph’s Missionary Society. But I started a new challenging missionary life when I joined the Diocese of Broome. Missionaries are called to dedicate their lives to Evangelisation with preference for the poor, the oppressed and those in greatest need. When I came to the Diocese of Broome, I came to realise that there is an urgent need for priests who can work very closely with the indigenous people. Right from the start, I felt very warmly welcomed by the original people of this land, and I found I was able, by God’s grace, to relate to them as my brothers and sisters, especially when they shared their stories with me. Newly ordained Fr John Bosco with some friends from Broome. Photo: Supplied. Because of the close friendships, I was moved to say to the Lord in the depth of heart: ‘Yes, I am ready to follow you, Lord, wherever you lead me’. I feel such joy, peace and gratitude to God whenever I go to the far off and small isolated communities to distribute Holy Communion. I believe strongly that my presence here helps them to welcome and share the blessings of the Lord which they long to receive. Looking to the future after my ordination, I hope to continue my friendly engagement with these various communities. By God’s grace and help, one important aspect of my mission is able to approach people of different backgrounds especially in the Diocese of Broome. I am seeking, in a spirit of dialogue, to listen to the Holy Spirit speaking through their cultures and traditions. In this respect, my mission becomes a humble attempt to find God’s unique presence among them and discern the working of the Holy Spirit among these indigenous people. I am deeply grateful to my family members who love and encourage me always through their prayers. I offer my deep gratitude to Bishop Christopher Saunders who welcomed me to the Diocese and invited me to share in his tireless service in the Kimberley. I express my gratitude to my Rectors, Formators, especially to my spiritual father Fr John Taylor MHM, as well as to my teachers over the years, so many well-wishers who have helped me to reach this stage in my missionary life.